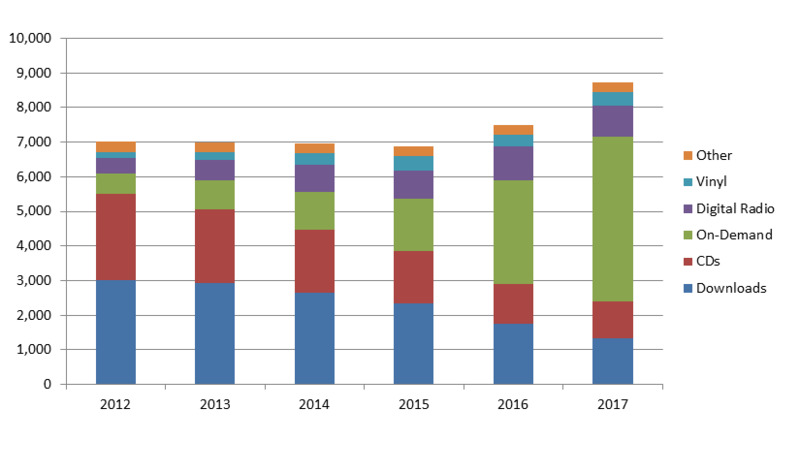 Every year in late March, the RIAA releases aggregated recorded music revenue figures for the previous year. The new figures for 2017 show that the music industry has completed the transition to a new era: the era of streaming. Streaming now accounts for almost two-thirds of industry revenue. It’s a new growth era as well: Total revenue grew a very healthy 17%, to $8.8 billion. And growth is accelerating, up from 9% last year. As this chart shows, the music industry’s previous era peaked around 2012. In that year, revenue from file downloads — mostly from iTunes — had surpassed revenue from CDs. Downloads brought in about $3 billion, or 43% of industry revenue, while CDs had declined 78% from their 2004 peak of $11.5 billion. This was the first full year of Spotify’s presence in the U.S. market, and on-demand streaming had just overtaken digital radio (à la Pandora and iHeartRadio) to achieve 8% of total industry revenue. After 2012, downloads started to decline, CDs continued their fall, and on-demand streaming started to pick up momentum. By 2015, Apple had finally launched its Apple Music on-demand streaming service, and total streaming revenue (on-demand plus digital radio) had grown to equal download revenue. By the year after that, on-demand streaming by itself had surpassed downloads. Streaming as a whole became the dominant source of music industry revenue in 2016. On-demand streaming — Spotify, Apple Music, Google Play and others — was the largest source of industry revenue but didn’t constitute a majority. Finally, in 2017, on-demand streaming became the majority source of revenue in the music industry; it pulled in $4.8 billion, or 55% of the total. The previous era represented the music industry’s nadir since the start of the digital age in the late 1990s. Revenues bottomed out in 2015 at just below $7 billion, down more than half from the industry’s 1999 peak. It’s hard to predict how long the new upward growth trajectory will last, because digital music service types come and go rapidly nowadays. But clearly the credit for the new growth goes to the industry’s ability to draw users away from file downloads — which are easily copied without permission — to services in which users pay for on-demand access to large catalogs instead of “ownership” of music tracks. The big hole in this argument, however, is YouTube. Although YouTube (used for free music listening) is by far the most popular on-demand streaming service, it belongs to a revenue category that the RIAA calls “On-Demand Streaming (Ad-Supported),” which generated only 14% of on-demand streaming music revenues last year. Meanwhile, it looks like the next music industry revenue model to fall off is digital radio. Services like Pandora, iHeartRadio, SiriusXM satellite radio and the streams of individual AM/FM stations delivered $965 million to record labels in 2016 but dropped to $914 million last year. There are many reasons for the downturn in digital radio revenue, although only some of them have to do with listener popularity. For example, services like Spotify and Google Play offer radio-style services, in which the user doesn’t pick the individual tracks, but the RIAA doesn’t put the revenue they make from such uses in its digital radio buckets. But otherwise, it’s possible that now that users have been shown the benefits of on-demand music listening, radio-style digital music will taper off in popularity. And that leads us to the the other interesting element of the new era in the music industry: the human factor. Two categories of music consumption that incorporate human factors are holding up well against the on-demand streaming tsunami: traditional radio and physical music products. Digital radio services may be in decline — Pandora has been struggling financially while iHeartRadio’s parent, iHeartMedia, declared bankruptcy last month — but good old-fashioned broadcast radio is doing fine. Market research published in February in the respected Infinite Dial study showed that AM/FM radio listening has been holding steady over the past few years. And because of quirks in American copyright law, the recorded music industry doesn’t get any revenue from broadcast radio listening (although the music publishing industry does). The music-plus-humans formula of traditional radio is a lasting one after all. We’ve heard about the resurgence of vinyl LPs. The RIAA’s 2017 revenue numbers show that while vinyl’s growth may have stopped, its market share has stabilized. Vinyl revenue crested in 2015 after a dramatic rise from near zero in the 2000s, but vinyl now appears to be stabilizing at about $400 million per year. In other words, vinyl may have peaked a couple of years ago as a hipster fad, but its core value seems to be living on. And of course those revenue numbers don’t include used vinyl, which is qualitatively huge but impossible to quantify. The same thing is happening with CDs and other digital products such as DVD-Audio discs. Those revenue buckets are still in decline, but the decline is leveling off. It looks like those products will still account for $1 billion within a $10 billion music industry this year. In this new streaming era of music, products and services that reflect the human touch are keeping their places after all.